King's-Edgehill School | Rock On, Curlers! Curling is trending at KES! This year, over 25 students signed up to participate in the wonderful sport of curling. 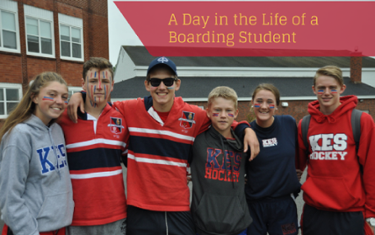 Everyone has been hurrying hard to learn the new sport, especially with help from the great coaching skills of David McCurdy (Grade 12). On December 2, a junior and senior school curling team competed in their first junior valley bonspiel held at the Windsor Curling club. The junior team was skipped by Annika Zeggelaar (Grade 7), followed by mate Athena Cox (Grade 8), second was Anastasia Dewar (Grade 7) and lead was Judy Park (Grade 12). The all-girls junior team hurried hard going against teams from Middleton, Glooscap and Berwick clubs. The all-boys senior (and German) curling team swept their way to victory. They were a natural! The team was skipped by David Ubber (Grade 10), mate was Finn Basser (Grade 10), second was Vincent Becker (Grade 10) and lead was Carl Beiderlinden (Grade 10). It was a great day for all, and we look forward to seeing everyone on the ice in January. Rock on!